Welcome Back Wafflewich & BBC WI! Happy Monday All! I was sooooo excited to sleep in this morning ~ after two weeks of early morning workouts, I earned that morning of not getting up to “feel the burn”. I have to admit though, my morning somehow seemed incomplete – like something was missing. I even decided to skip my Morning Burst (hot water plus lemon) to have some Decaf Cinnamon Vanilla Nut Coffee. You know what ~ It didn’t taste good! I wanted hot lemon water…..funny how we work, right? I found the BIGGEST glass I could to make up a Morning Burst and have exactly what I was crazing ~ A Wafflewich! And up close and personal! Two weeks is just too long to go without one of these fantastic sammies! All for 6 Weight Watchers Points and worth EVERY BITE! Ok, so I have to share with you what absolutely MADE my day today……aside from my Wafflewich. My 14 day Bikini BootCamp Results! Weight lost: 5.6 lbs!!!! How awesome is that?! Inches lost all around (some areas got bigger – go biceps & calves, while others smaller) 2.75 inches lost! Awesome! It made EVERY day totally worth it. I really think it helped me not to peak at the scale each day and let that dictate my mood. This was my mid-month check up and I like what I am seeing. As I told you all last night I plan on keeping with several aspects of the program for the month and turning them into a lifestyle. * I am allowing myself one “treat” meal tomorrow and making a healthy steak dinner tonight for The Husband (so he doesn’t disown me). Everything else in between will be BBC. * I am modifying my eats to fall into their eating concepts/categories (light breakfast with fruit/veggies plus protein, salad type lunch, 1-2 light snacks, soup plus healthy carb, lean protein and healthy fat dinner with the occassional dessert. * Workouts ~ I will continue working out 6 out of 7 days a week and plan on doing morning/afternoon workouts often. I think that’s a good start ~ My next Weigh In point will be before our Vegas Trip, 06/25/09 and then a final Weigh In at the end of the month when we return. Here are some FUN THINGS to check out today! * Heather is having one of the best giveaways ever – a FREE YEAR of Yoga downloads. Click HERE to check it out. * Michele is hosting a Naturals Giveaway – Click HERE. * And if that wasn’t enough Giveaways to satisfy you, Tip Junkie is having OVER 50 Giveaways. Click HERE to check them out. You can now enter my fantastic Healthy Holey Donuts Giveaway. Click HERE! « My Holey Donuts Giveaway!!!! GREAT results danica! congrats to you, maybe i should do that challenge.. you made it seem SO easy! Way to go, Danica! You did so great! It's been awesome being your Bootcamp Buddy. I love your thoughtful goal plan. Planning is key! I'll post my results after work tonight. ooohhh, suspense! such an awesome feeling. way to go! that wafflewich looks yummy in the tummy. Way to go with the challenge!! The ideas you've decided to stick with sound great! Great job on the weight loss! 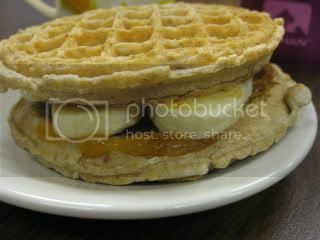 The wafflewich is such a great idea! I will absolutely try this soon! My kids would love it! You had an amazing commitment to that challenge and you deserved every pound lost! 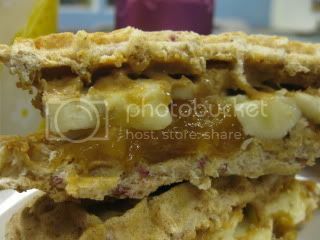 Wow, what a phenom wafflewich! RunSarah ~ Thanks, I was definitely excited to see the scale for once! Janetha ~ Thanks – It took alot of planning but that is exactly what made it easy. Jenny ~ Thanks – I am trying! Angelea ~ Thanks for offering up the challenge – I really enjoyed it and having you as my body! Your results were amazing as well! 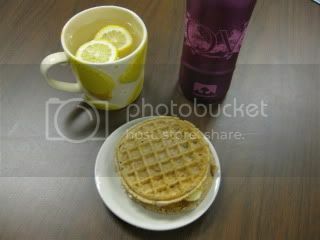 Amanda ~ I heart wafflewiches – they are so easy and sooooo good! K ~ Hmmm…I wonder if that is my type of Kashi…I bought them in this huge box at Costco. If not, I will definitely look for that one. Sarena ~ Thanks. 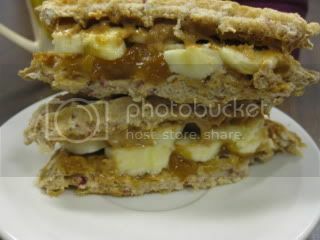 You can have fun putting all type of fruit in your wafflewich for your kiddos! Marisa ~ Thanks – you are my favorite personal cheer leader. Now if I can just keep that motivation going strong, right?! Julie ~ Thanks – waffelwiches rock! Broccolihut – You need to try them, I think you will end up hooked.